Why has private participation in the urban water sector failed to take off? In India, there is an inextricable link between water and politics. This was very much in evidence recently when the opposition walked out in the Karnataka assembly over the proposed privatisation of Bangalore's water supply system. Water tariff had earlier been hiked steeply in the city to pave the way for the transference of control. Ironically, the legislators' protest was staged despite a partial rollback. Pockmarked by such bottlenecks, the deal -- for which negotiations have been underway with French companies Vivendi and Ondeo since early 2001 -- is yet to come to fruition. Unfortunately, most of the country's other experiments with privatisation in the water sector have fared even worse. And the reason is not far to seek. Access to water -- a natural resource -- is considered to be a basic right of the people in India, and providing it a fundamental responsibility of the government. But privatisation is guided by the cost-recovery regime, making water unaffordable for many and turning the issue into a political hot potato. So why was the avenue of privatisation explored in the first place? Again, one has to merely skim the surface to arrive at the answer. The urban water management and distribution system in the country is in a shambles. While the services provided by the state-run water utilities are inadequate, infrastructure needs to be overhauled as well. Then there is the flawed subsidy system that has dealt a crippling blow; it aims to provide easy access to the urban poor, but in practice ends up supplying water at a ridiculously low rate to the urban rich. Add to this the huge losses incurred due to leakage and pilferage of water, widespread corruption and the abysmal record of the authorities in recovering dues. Clearly, the government-run civic bodies are out of their depth, deluged as they are by a plethora of problems. 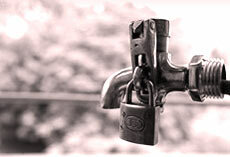 Privatisation has also been cited as an essential prerequisite by various lending agencies. For instance, in several countries the International Monetary Fund (imf) lays emphasis on some form of privatisation. "The role of the World Bank (wb) is to highlight the issue," points out Salman Zaheer, lead utilities specialist with the wb's water agency, Water and Sanitation Programme (wsp). Consequently, about a decade ago, the Union urban development ministry joined hands with the wsp to develop guidelines for privatisation of the urban water sector. "Private sector participation was expected to usher in fresh investment and modern technology, and infuse new life in this ailing sector," says B K Pradhan, joint secretary, Union urban development ministry. So why has the much-hyped initiative failed to deliver? Divorced from reality "The projects are simply not financially viable," says V Satyanarayana, infrastructure finance advisor with the Indo-us Financial Institution Reforms and Expansion (fire) Project, a United States Agency for International Development (usaid)-funded body under the Union ministry of urban development. It is obvious the privatisation protagonists forgot to take into consideration the myriad complexities of the Indian water management system that are deeply embedded in the country's society, politics and economy. The initial plans, now referred to as 'first generation projects' (see: Water deals: a wishy-washy affair), were 'bulk transfer' deals wherein the private firm was allowed to collect water from the source and transfer it to the distribution network. The firm was also responsible for operation and maintenance, billing and sewage treatment. While a controversy over tariff restructuring led to the scrapping of such a project in Pune, Maharashtra, the model being followed by Tirupur in Tamil Nadu requires the concerned firms to set up the system, own and operate it for a period and then hand it over to the civic authority. The premise of letting the municipal body regain control in the future, without any guarantee that it would streamline its functioning, has given rise to fears that the situation would be back to square one. Almost all the other first generation projects are now languishing. Some have been officially shelved and replaced by fresh ventures. These 'management contracts' are drastically scaled-down versions of the original privatisation scheme. As per these, the firm can handle one of the sections such as operation and maintenance or billing. The government retains the assets with only a part being leased out. Usha Raghupati, research professor with the National Institute of Urban Affairs (niua), a Union urban development ministry body, believes that the contract system can be further broken down. "Full privatisation cannot be done; unbundling of the overall system will work where parts of the system can be contracted out to a firm," she avers. Bangalore is one such case. Its sound infrastructure should work to its advantage. M N Thippesamy, chief engineer of Bangalore Water Supply and Sewerage Board (bwssb), exudes optimism: "The deals with the firms are almost through." Anand Kumar, director of business development in Ondeo, is guarded: "It's a learning experience, and we are just in the negotiations phase." The fact is that there are teething troubles aplenty. In Maharashtra's municipal town of Sangli, private companies are being invited on a contract basis and the tariff issue has been put on the backburner. Apart from such small steps forward, however, the privatisation effort has proved to be a damp squib. Several factors have contributed to this debacle. The faulty perceptions of the two key players -- the industry and the government -- have obfuscated the issue. Private companies, especially foreign aspirants, have viewed water as a commodity assuming that it would fetch them adequate returns if priced correctly. They advocate the full cost pricing concept wherein the tariff reflects the cost of water supply as well as sewage treatment, and the amount is recovered from the consumer. The wb plan also lays stress on the need to enforce full cost pricing before a private firm is invited to invest. Nasser Munjee, deputy managing director of the Infrastructure Development Finance Corporation in Mumbai, says: "Water is an economic service, not a social obligation. So tariff has to be hiked if required." In the Indian context, this approach is completely erroneous. Says A V Vaidyanathan, water expert with the Madras Institute of Development Studies in Chennai, "It is not correct to describe water as a commodity. It is a public utility which can be priced, but within certain socio-economic parameters." This is vital because the existing water and sanitation technology, based on the flush toilet and sewage systems, would make full cost pricing of water and sanitation services virtually unaffordable for most people living in India's urban centres. According to Jairam Ramesh, secretary of the economic affairs department in the Congress party, "Water is in the public domain and any commercial enforcement on it is bound to be tough to impose." The private sector has focused only on supplying water and is averse to pumping money into sewage treatment. While the former is a small and profitable segment of the water business, the latter is its most cost-intensive and crucial component. The real cost is involved in treating sewage to make it suitable for disposal in waterbodies. The wb is aware of the significance of sewage treatment, but confesses that it has not paid much attention to this aspect. "We have left it to the discretion of the industry players," admits Zaheer. The government, too, is guilty of derailing the privatisation process. A wb report squarely blames politicians for the collapse of the Pune project. Lee Baker of usaid says, "No politician has really come to grips with the link between reforms and sensible pricing." The sheer scale of the required price hike (see table: Costly conversion) also acts as a major deterrent. This can be gauged from the recent slashing of tariff in Bangalore by 71 per cent. "In view of the country's widely varying tariff structure, the process of fixing prices will be a time-consuming one," points out Pradhan. Water utilities in India have two main sources of revenue -- water tax, based on property values, and water charges, based on water consumption. There are inherent flaws in both cases. While water tax can be levied only on registered properties, excluding about 60-70 per cent of the population from the tax net, water charges overlook unconnected settlements. Over the past 10 years, many cities have tried to bridge the gap between revenue and expenditure but almost all continue to face a growing deficit. A wb-sponsored study on tariff models in India carried out by niua three years ago presents a dismal picture. The yet-to-be-released report states that as per a survey carried out in 300 towns and cities, municipal corporations in India have incurred 25 per cent losses. This is in stark contrast to the global standard of 8 per cent profit, including recovery of capital cost. "The real issues to be kept track of are cost recovery and effective regulation," points out Vaidyanathan. Closely connected with the collection of dues is the problem of urban slums. The poor maintenance of infrastructure and low recovery of the cost of supply in these areas are causes for concern. "There is nothing to prevent cross-subsidisation from the rich to the poor in determining the rate structure," opines Vaidyanathan. As per this model, rich domestic consumers and the industry will have to pay more for the subsidy given to the slums. But there would be little incentive for a private company to fulfil such a complex task; in effect, without any democratic accountability, those with the deepest pockets tend to get the most water. Mark Dumol, ex-chief of staff with the Philippines' Manila Water Supply and Sewerage Board, says: "Without putting a tariff regularising body in place, India cannot expect reforms in the water sector. Note: Bangalores pre-rollback tariff of Rs 10 per kilolitre has been used as a benchmark to calculate the price hike for other cities since this figure more or less meets full cost pricing levels. It has also been assumed that the infrastructure in other towns and cities would be on a par with that of Bangalore when the hike is effected.
" At present, the government sets the tariff, manages the system and also monitors it. For Junaid Ahmad, south Asia team leader of wsp, "The aim is to separate the judge, the jury and the executioner." P Mitra of Vivendi wants to "let the regulatory body develop along with the privatisation process". Who then should be the regulator? It is widely felt that the onus for fixing tariffs lies with the government, which formulates policies and regulations. Citizens are of the view that along with the authorities, who should not completely relinquish control over water, they too should have a say in the matter. Cities experimenting with privatised water systems have not experienced the improved supply, efficiency and safety promised by corporations and their financing partners. Rather, water is provided to those who can afford it and domestic needs invariably fall behind those of the industrial sector. The past decade's performance, therefore, indicates that the government-private sector combine has failed to click. Despite this, the government and the wb don't seem to have learnt lessons from past mistakes. In fact, their guidelines for 'Public Private Participation in the Urban Sector' will, in all likelihood, be a charter of unrealistic norms. India needs to adopt an innovative approach to refurbish and remodel the urban water management system. The sector will attract private investment of the scale that it requires, only if appropriate reforms such as an overhaul of infrastructure, restructuring of tariff, recovery of costs and metering are introduced immediately. Most importantly, however, the public will have to be taken into confidence. A glaring defect in the 'deals' struck till now is the lack of transparency. "We are informed in the vaguest terms that the private sector is going to manage the local water utility, but kept guessing thereafter," laments Sivaram Prasad, a consumer in Hyderabad. K S Gujral, a Delhi councillor, harbours a similar grouse: "We have the right to know the terms and conditions before such decisions are made." Private firms, on their part, appear to be more concerned about building their corporate image. Vivendi, for instance, has hired international public relations firm Indian Public Affairs Network (ipan). "To embark on the path of reform, broadening of ownership beyond the corporation is required," says Satyanarayana. There will be no worries about a private firm monopolising the sector if local dwellers are permitted to play the role of civic monitors. Because as the late Anil Agarwal, founder editor of Delhi-based non-governmental organisation Centre for Science and Environment (cse), had pointed out: "The answer (for salvaging the battered water management system in urban India) lies not in full cost pricing, but in political decentralisation and empowerment." So that cost recovery and social justice go hand in hand.